This is an easy to use software that convert your paper document to PDF file. 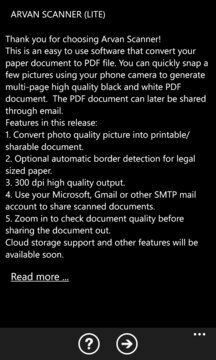 You can quickly snap a few pictures using your phone camera to generate multi-page high quality black and white PDF document. The PDF document can later be shared through email. 1. Convert photo quality picture into printable/sharable document. 2. Optional automatic border detection for legal sized paper. 3. 300 dpi high quality output. 4. 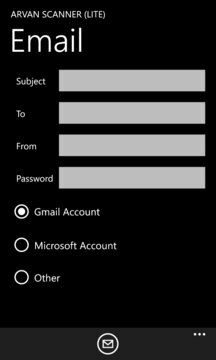 Use your Microsoft, Gmail or other SMTP mail account to share scanned documents. 5. Zoom in to check document quality before sharing the document out. Cloud storage support and other features will be available soon.